You will need to understand scientific theories for the GED Science test. The general public often dismisses scientific theories as irrelevant hunches that scientists have. In the world of science, however, a theory is an interpretation of the facts. Although the theory is subject to change, it’s not a willy-nilly guess. Hypothesis: An explanation of a limited number of observations based on experience, background knowledge, and logic. Theory: An explanation of a wide range of observations presented in a concise, coherent, systematic, predictive, and broadly applicable statement. A theory explains why a certain thing or condition is the way it is. A theory can’t be considered to have been proven by the results of a single experiment. Law: An explanation of a wide range of observations that will most likely not be proven wrong. A law is less likely than a theory to be proven wrong. However, a law doesn’t necessarily describe why something is the way it is. A law is more useful at predicting outcomes. Any theory that has been proven repeatedly with consistent results may become a scientific law until disproven, in which case its status returns to that of a theory. You may also hear the term model, which is a concept that has some validity and can be used to formulate predictions that are accurate only under certain limited conditions. Meteorologists often use different models to predict the weather. You can read about challenges to scientific theories in the news. Nearly every day, someone challenges the theory of global warming, questioning whether Earth really is heating up, whether the problem really is related to the amount of carbon in the atmosphere, and whether human activities really are the primary cause. And perhaps that theory itself will continue to evolve as technological advances reveal more about ecology and the effects of the potential life of living, breathing creatures on Earth. However, many people dismiss theories more out of ignorance than anything else. Global warming skeptics, for example, point out that Earth has experienced numerous cycles of warming and cooling over its 4.5 billion years of existence, failing to recognize that the current warming trend doesn’t follow the same pattern as those other cycles. This doesn’t mean that all global warming skeptics are ignorant. It just means that if you’re going to question or challenge a theory or conclusion, you need solid evidence to dispute it. On the test, you may encounter questions that involve making a judgment call on whether evidence supports or challenges a theory or conclusion or what theory or conclusion can be drawn from a particular data set. Which of the following pieces of evidence does not support the conclusion that H. pylori bacterium causes peptic ulcers in humans? (A) Nine out of every 10 participants in a study who were infected with H. pylori bacterium developed peptic ulcers. (B) Antibiotics that kill H. pylori bacterium have proven 90 percent effective in treating peptic ulcers. (C) Eight out of every 10 animals infected with H. pylori bacterium developed peptic ulcers. (D) Thirty to fifty percent of the population is infected with the H. pylori bacterium. Which conclusion can be drawn from the following data? (A) Increased sugar consumption raises blood pressure. (B) People should stop consuming sugar. (C) Blood pressure is not affected by sugar consumption. Medical researchers are beginning to believe that cholesterol-lowering medications used to treat patients with heart disease may cause dementia. Which of the following pieces of evidence would provide the best support for this conclusion? (A) Several doctors reported that patients of theirs who had been prescribed cholesterol-lowering medication suddenly developed problems with thinking and memory. (B) A double-blind, placebo-controlled study involving 200 participants demonstrated cognitive decline in patients taking a cholesterol-lowering medication. (C) One patient reported cognitive difficulties while taking a cholesterol-lowering medication. (D) In several trials, rats given high doses of cholesterol-lowering medications developed cognitive difficulties, as measured by their performance in navigating complex mazes. The fact that a certain percentage of the population is infected with H. pylori bacterium, Choice (D), doesn’t mean that it causes peptic ulcers. The higher the percentage of calories from sugar, the higher the blood pressure, so Choice (A) is the correct answer. A well-controlled study, Choice (B), provides better evidence than clinical evidence from doctors, Choice (A), or patients, Choice (C). Choice (D) represents good evidence, but the fact that high doses of medications cause a certain side effect in rats doesn’t necessarily mean that a standard dose of the medication in humans will cause the same side effect. While evidence may support or challenge a scientific theory, you can go the other way and use scientific models and theories to explain natural phenomena and to predict the outcome of certain experiments or natural occurrences. On the test, questions may challenge your ability to apply scientific models and theories. Matter has three phases: gas, liquid, and solid. In gases, molecules are separated with no regular arrangement. In liquids, molecules are close together with no regular arrangement. In solids, molecules are tightly packed in a regular pattern. This illustration represents which of the following? 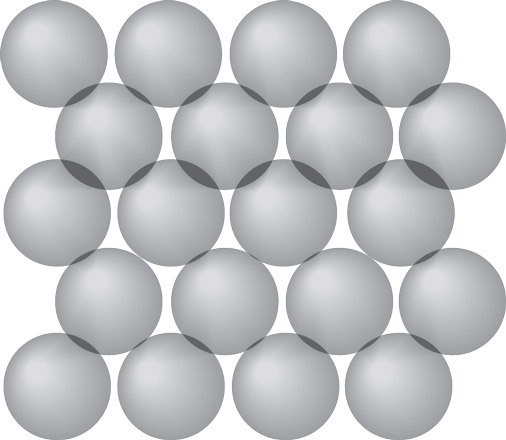 The illustration shows molecules packed closely in a pattern, representing a solid, Choice (C).